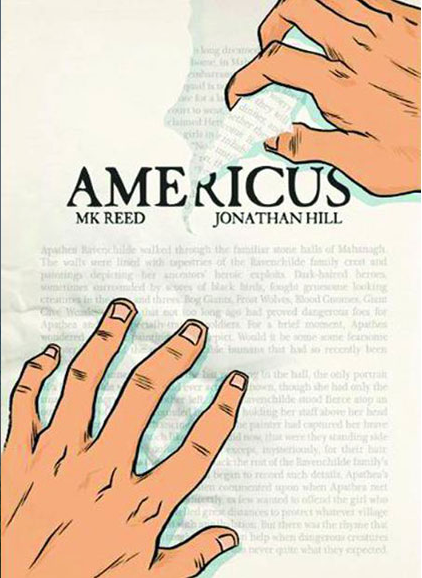 "AMERICUS" by MK Reed and Jonathan Hill should feel really relatable if you read fantasy and if you are not in favor of book banning. It's about Neil, a 14-year-old boy in a town called AMERICUS. He loves a book series about witches called Ravenchilde. His best friend, Danny, also loves it, but comes from a very fundamentalist Christian family. His mother is so furious when she finds Danny reading the books that she ships him off to military school. Sad and alone, Neil spends most of his time reading, until Danny's awful mother starts a protest to ban Ravenchilde. One of Neil's other close friends is the local librarian. The librarian is one of my more well-liked characters. She has a very passionate personality especially with regard to her books. She's not like that stereotypical kind of mean old lady librarian. Neil starts working at the library when he gets to high school. He spends alot of time with the librarian trying to prevent the book banning. There is a community meeting on the topic of banning Ravenchilde. Neil makes a speech about why Ravenchilde is important to so many people. And with the help of many families, Neil prevents the book banning. Neil also starts listening to punk rock music just like me! The artwork in AMERICUS is somewhat like the artwork in Crogan's Vengeance. It is definitely drawn with a paint brush. All of the characters have a distinct look. I especially like how family members look alike. Danny's whole family has the same hair and nose. 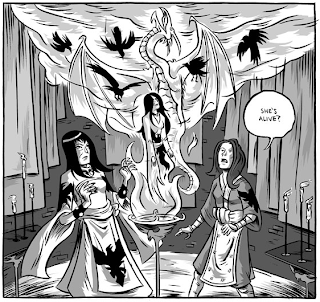 The artist also gets a chance to draw the fantasy characters of Ravenchilde. I would not suggest this book to the younger audiences. There is a bit of strong language in it, but if you know you can handle it, I would strongly suggest reading it. It is a very entertaining book. I'm most certain you will enjoy it to the fullest. Milo! I will be sure Sage (my son) reads your review of this one for sure... he got one of the books that you recommended earlier, Cardboard, and he keeps meaning to write to you to talk about it, but he had a horrible operation, and had his wisdom teeth out, and I'll spare you the rest, bc I think reading that you had braces... hopefully, yours are already off, I just remembered a cartoon of your mom's, when you threw your retainer away! Sage just went back to school today, and he's verrrry grumpy, and his teeth are still hurting- he's way jealous that your mom is homeschooling you! Great review, Milo! And really well written. Sounds like Nick would really like this book too. I’ll have to get it for him, if only to swipe it and read it myself. Well done! Excellent review! Good use of specific, descriptive words and all that English language stuff! 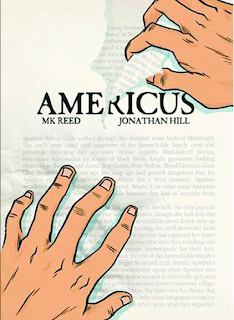 Also, what you say about Americus makes me want to read it, which is the best thing a review can do. I've heard stories over the years about books being banned from libraries and school boards aggressively controlling what kids can and can't read. UnAmerican! What a great blog! So helpful for old fogies like me. I will definitely use your reviews to suggest graphic novels my sons might like. I especially like your advice about age appropriateness, very useful to me. Love your reviews and looking forward to the next one! You've convinced me yet again! I grew up in a fundamentalist Christian community myself - one local bookstore even keeps books about the occult, AND by Neil Gaiman, in a special locked section - so book-banning speaks very deeply to my repressed soul. Props to radical librarians! And to you, of course. Went to the library yesterday and picked this up on your recommendation. I loved the way you described the librarian. I also love punk rock! Keep up the good work! Great review, Milo. I especially like your lede (first sentence). And it sounds like something Zach would like as well. Thanks, dude. Any recommendations for war graphic novels?